This is found in particular in Lower Egypt, as well Syria, but there only after the fifth century. The great father of this form of life is St. Anthony. At about twenty years of age (c. 269), he heard Christ’s words, “Go, sell all you have and give to the poor and come and follow me” read aloud in Church. He thus freed himself of the confines of his possessions — although not without first securing a stable existence for his sister, for whose care he was responsible at the time (he entrusted her to a Parthenon, showing that community life for women already existed) — and followed Christ into the Desert. His withdrawal was a gradual one: he moved further and further away from human society until, c. 285, he reached the deep desert, the outer mountain at Pispir, where he struggled day and night to liberate his true self from the ‘zombiefying’ delusions of the passions and the demons. Around 305, having attracted a number of followers who were inspired by his discipline and holiness, he came out of his seclusion to advise others in their own struggles. In what sense is it characteristic of following Christ to flee to the desert? The answer to this may be found in considering Christ’s own departure to the desert prior to his ministry, as well as his departure to the desert after the death of St. John the Baptist. 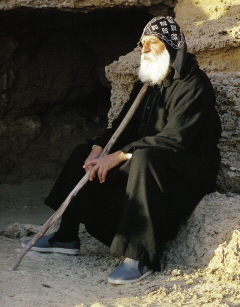 By following out Lord into the desert, St. Anthony was entering a terrain already targeted and stamped out by our Lord as a specific place for spiritual warfare. There is both specificity and type in the desert. In those geographical regions where are no deserts, there are places which are similar to or approach that type of place symbolised by the desert. It is that type of place which allows the human heart solace, isolation. It is a type of place which puts the human heart in a state of aloneness, a state in which to meditate, to pray, to fast, to reflect upon one’s inner existence and one’s relationship to ultimate reality — God. And simultaneously where the opposing forces to spiritual life can become more dominant. It is the terrain of a battlefield but a spiritual one. And it is our Lord, not St. Antony, who has set the precedent. Our Lord says that “as for what is sown among thorns, this is he who hears the word, but the cares of the world and the deceit of riches choke the world, and it becomes unfruitful.” The desert, or a place similar, precisely cuts off the cares or anxieties of the world and the deception, the deceit of earthly riches. It cuts one off precisely from “this worldliness” and precisely as such it contains within itself a powerful spiritual reason for existing within the spiritual paths of the Church. Not as the only path, not as the path for everyone, but as one, full authentic path of Christian life. Previous Post Old Man, How Do You Pray? Next Post What To Read – At The Beginning Of The Journey!